The acceptance and rejection letters for pycon arrived this week and so did the final list of selected talks for Pycon US 2017. Complexity science is one of my favourite topics, ever. Studying complexity is how I ended up in the computer science bandwagon in the first place, and I constantly find myself thinking about how individual agents’ decisions affect the overall state of systems. Self-organization and emergence are fundamental aspects of how the pieces of the complexity puzzle fit together, and Wolfram’s elementary cellular automata are a great way to understand them. This blog post gives an introduction to some techniques for benchmarking, profiling and optimising Python code. Writing consistent, well-formed code is important. Of course the functionality of the code is paramount, yet in addition the styling and structure should follow a commonly accepted standards. Not only will it make the code more approachable to others, but also to yourself, when you return to an old piece of software, which you have not looked at for months or even years. You might even squash some bugs early on, by writing code in consistent manner. The process of styling and checking of these code qualities, is often referred as linting. I've chosen to start with Harvard's Data Science course. I'm currently on week 3 and one of the suggested readings for this week is Jake VanderPlas' talk from PyCon 2016 titled "Statistics for Hackers". As I was watching the video and following along with the slides, I wanted to try out some of the examples and create a set of notes that I could refer to later, so I figured why not create a Jupyter notebook. In this article I am going to look at Spark Streaming. This is one of several libraries that the Spark platform provides (others include Spark SQL, Spark MLlib, and Spark GraphX). Spark Streaming provides a way of processing "unbounded" data - commonly referred to as "streaming" data. It does this by breaking it up into microbatches, and supporting windowing capabilities for processing across multiple batches. You can read more in the excellent Streaming Programming Guide. EK/LS 越来越有标准相了,当然的 Python 的各种绑定也快速跟上了, 幸福. Do you know the difference between the following syntax? [x for x in range(5)] , (x for x in range(5)), tuple(range(5)) Let’s check it. 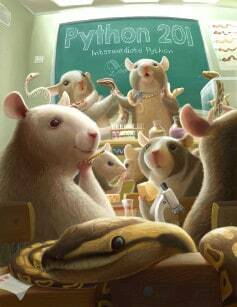 Comprehensive Python quiz and questions from basic to advanced level that help you to review your Python knowledge and become the master of Python.